What is PC Focus Control? What is a Digital Readout (DRO)? 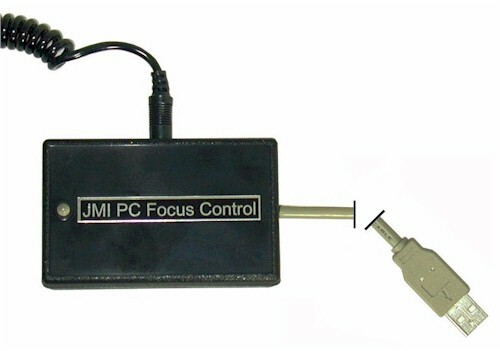 The Smart Focus system allows one to remotely control a JMI focuser or MOTOFOCUS unit (not included) using computer software. Popular CCD software (not included) can be used to automatically focus a CCD camera (a couple of examples are listed below). For more information, see Purchasing Hints and Motor Control Diagrams where you can compare PCFC and Smart Focus. 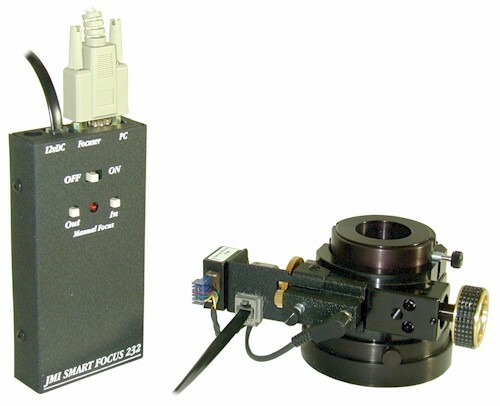 Smart Focus includes a hand control, AC adapter, focuser/encoder cable, serial computer cable and basic focuser control software. The hand unit has two directional focusing buttons, a power jack, a DB-9 serial connector and a DRO encoder jack. It can be operated using a 9-volt alkaline battery (included). 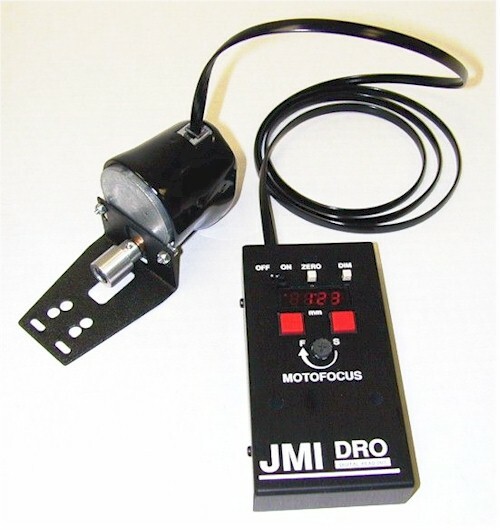 One end of the focuser/encoder cable attaches to the hand control and the other end to the DRO encoder assembly installed on the JMI focuser or MOTOFOCUS motor (required, see below). The serial cable connects between the hand control and the 9-pin serial port of a PC-compatible computer running Windows 95/98/NT/2000/XP/Vista/7. Most current laptops do not include a 9-pin serial adapter. Therefore, you will need to purchase a USB to Serial Adapter (USB to 9-pin Serial). If you purchase a USB Null-Modem Serial Adapter you will also need a straight-through 9-pin serial cable as apposed to the 9-pin null-modem cable which we supply (please see note regarding serial ports). JMI's standalone basic focuser control software (included on our website, call for a CD) is sufficient to control the focuser through the PC. Automatic focusing can be accomplished through popular CCD imaging software (not included) such as Cyanogen's MaxIm DL/CCD (using SharpStar) and Software Bisque's CCDSoft (using @Focus). Due to the modular design of the JMI EV focusers, they can be very easily upgraded after purchase to include Smart Focus. 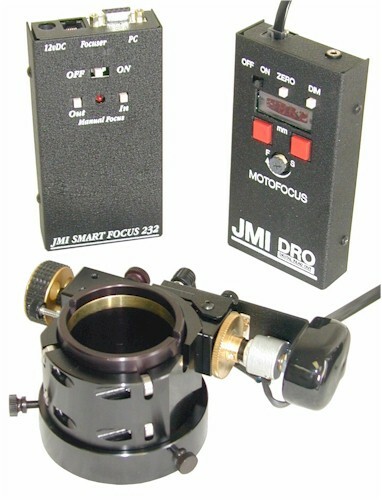 Smart Focus requires one of the DRO Encoder Assemblies for a motorized JMI Focuser or MOTOFOCUS unit (not included). 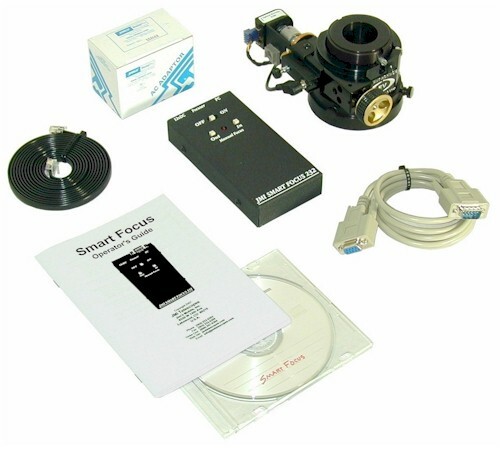 Smart Focus includes an A/C adapter, focuser/encoder cable, serial cable and software. Smart Focus will only work correctly with MOTOFOCUS units that can accommodate an encoder and use a non-slip coupler. If your current MOTOFOCUS system uses a slip-clutch feature, such as an o-ring coupler, ask us about a conversion kit. Since the Smart Focus stand-alone basic focuser control software is designed around slippage at the end of focuser travel, manual setup procedures must be used with MOTOFOCUS equipped focusers (see the Smart Focus Manual, document 29, in our Document Library). Smart Focus is not recommended for use with an SCT focus knob due to image shift (mirror slop) and the inability to train the system normally. Are you in need of (more) serial ports on your computer? See how you can add more RS-232 serial (DB9 connector) ports. An EV-2cM is shown here with the DRO encoder and hardware installed and a Smart Focus hand unit. These components (Smart Focus hand unit, DRO encoder with mounting hardware and Focuser or MOTOFOCUS) make up the complete Smart Focus system. The Focuser and DRO encoder and hardware must be purchased separately. 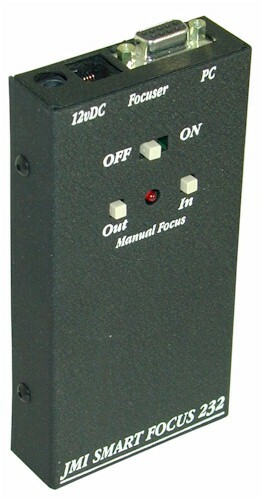 The top end of the Smart Focus Hand Unit includes a power jack, telephone-style jack for connecting to the focusing device and a DB9 (RS-232C) jack for connecting to the PC. PCFC controls a DC focuser motor from your PC through a USB port. Basically, it replaces a regular hand unit with control from a computer using a mouse. It gives greater control of speed and duration of movement than a regular hand unit. It can control EV Focusers, NGF Focusers, RCF Focusers, MOTOFOCUS, MOTODEC and other motors. No batteries are required. There is no encoder feedback or positional display with PCFC. If you desire focus control with encoder feedback, please see Smart Focus. For more information, see Purchasing Hints and Motor Control Diagrams where you can compare PCFC Smart Focus. * Many astrophotographers need to use two focusers, one for their imaging scope and one for their guide scope. PCFC2 was created for this purpose. It is identical to the PCFC hardware in all respects except for its USB identifier. Now you can run two focusers, one from a PCFC, and one from a PCFC2. Separate software is required (Free Download from JMI website). NOTE The focuser cable must be purchased or supplied separately. 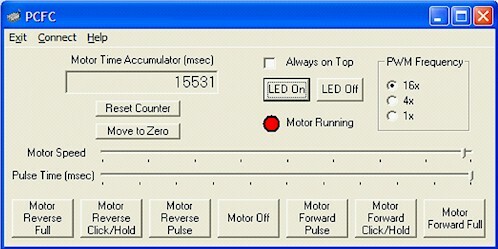 The PC Focus Control (PCFC) software allows one to control the pulse run time and speed of a 5-12 volt DC motor from a Windows-based computer. 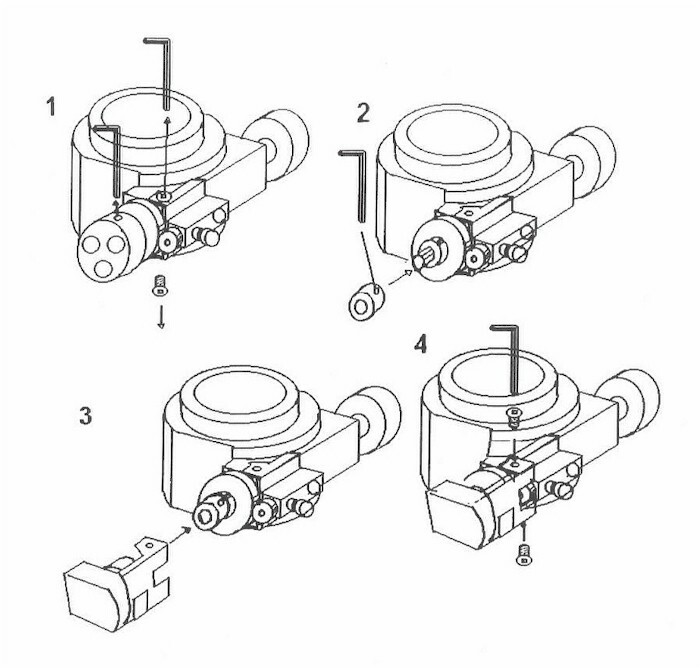 This is the portion of a DRO system that attaches to the JMI EV or NGF focuser. (Specify the focuser model.) A Smart Focus unit is also necessary for proper operation. Due to the modular design of the JMI EV focusers, they can be very easily upgraded after purchase to include the DRO Encoder Assembly. If you do not have a motorized version, see our EV Focuser Individual Parts for a motor upgrade. For a visual description of the system see Motor Control Diagrams where you can compare PCFC and Smart Focus. For all JMI focusers we need to have certain information in order to supply the correct parts. When ordering, please place a note in the shopping cart Comments area identifying the focuser. For Event Horizon (EV) focusers, "EV" is sufficient information. For all other focusers, specify the model and date of purchase (date of manufacture if known). A digital picture is "worth a thousand words" in describing the specific model. If you email a picture, please give us your Order ID along with your Name. If we need more information, we will contact you. 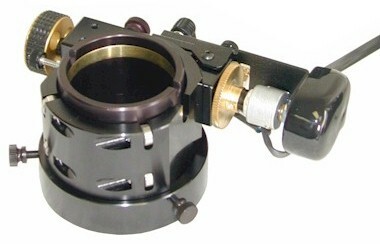 This picture shows the EV-2cM focuser equipped with an Encoder Assembly. The DRO Encoder Assembly can be retrofitted to any of our old NGF focusers. A motor must be included with the focuser. 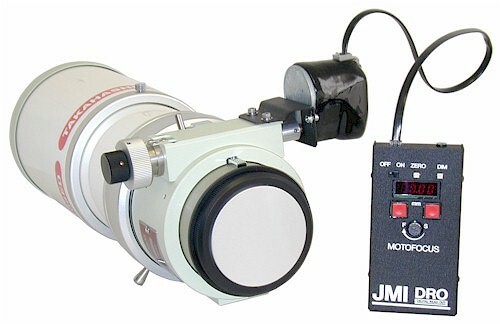 For an aftermarket upgrade of a manual NGF to the required motorized version, refer to Motors for JMI NGF Focusers on our Focuser Accessories page of our Online Store. In most cases you do not need to return the focuser for the upgrade. All NGF-1 focusers being upgraded with a motor must be returned for modifications to the base. If you have an original NGF focuser (see DRONGFO listed above) we recommend that the focuser be returned to JMI for the motor and DRO upgrades. With some of these original focusers we may not be able to provide the right parts without examining the focuser and there may be an extra charge for specialized parts and/or labor. The normal labor charge for an upgrade is $20. If you place an order without returning the old focuser, we will need to know approximately when it was manufactured. Damage done during installation by anyone other than factory trained technicians will void the warranty. Please see our document titled JMI Return Policy for additional information. When upgrading EV or NGF focusers at the time of purchase, the standard hand unit is not included as this is offset by the cost of installation of the DRO Encoder Assembly. The EV-2cM is shown here with the encoder and hardware installed for a DRO system. For a Smart Focus system, the Smart Focus hand unit (left) replaces the DISCONTINUED regular DRO hand unit (right). The DRO Encoder Assembly upgrades a MOTOFOCUS unit with a piggy-back DRO encoder assembly (see exceptions below). This is the portion attached to the MOTOFOCUS motor. A Smart Focus system is also necessary for proper operation. The picture at left shows our DISCONINUTED DRO Hand Unit (right) along with the DRO Encoder equipped MOTOFOCUS unit. Only Smart Focus is available now. The piggy-backed DRO Encoder Assembly is not available for MOTOFOCUS units that use the miniature motor (e.g. Meade ETX Series, Celestron NexStar non-GPS Series, etc. Call to see if your choice has a miniature motor.). MOTOFOCUS units manufactured after January 1, 2000, with our standard pear-shaped motor, are upgradeable to DRO with an additional labor charge. They must be returned to JMI for the upgrade. Most other MOTOFOCUS units cannot be upgraded after purchase. If you plan on using Smart Focus with a MOTOFOCUS unit, please see the notes under Smart Focus above. When upgrading MOTOFOCUS at the time of purchase, the standard hand unit is not included as this is offset by the cost of installation of the DRO Encoder Assembly. DRO installed on a MOTOFOCUS motor will be somewhat different from an installation on an EV focuser. The accuracy will vary depending mostly on how much slop there is in the focuser mechanism itself. Note that this picture shows the DISCONTINUED DRO HAND Unit (right). 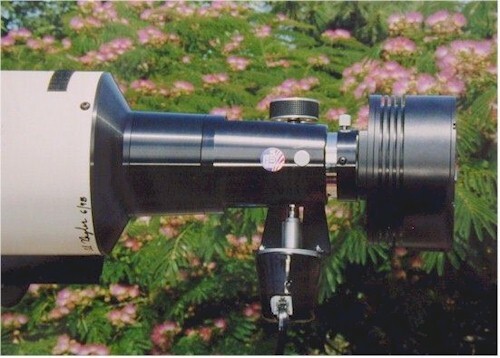 This photo shows the (MFGEN) MOTOFOCUS with DRO Encoder Assembly mounted on a Tele Vue 140 SDF using a CCD camera. Photo and comments provided by Dan Richey. What is PC Focus Control�? Digital devices such as our DRO Encoder Assemblies give precise discreet signals indicating increments of movement. This movement is usually a shaft in the encoder that is connected to moving parts of a telescope or accessory, such as a focuser, by gears, belts or a friction drive. This digital data is fed to a device that shows, in a digital format, the movement of the focuser. Here are a few Typical Configurations for digital focusing on a Schmidt-Cassegrain Telescope (SCT). They include part numbers and basic specs for comparison. The following is a Visual Summary of the products found on this page along with the standard single- and dual-control hand unit configurations for comparison. Click on parts of the pictures above to link to related products, pictures or descriptions. NOTE: Customer comments may include comments about our DISCONTINUED DRO Hand Unit. Sometimes certain Microsoft Libraries can become unregistered when installing and uninstalling a lot of software. One very common problem is the MSCOMCTL.OCX. To correct the error, first search your drive for MSCOMCTL.OCX to see if you have it. If not, you can download it from HERE. The file should be placed in your C:\WINDOWS\SYSTEM directory or C:\WINDOWS\SYSTEM32 if you are using WinXP. Once it is there click START > RUN and type "REGSVR32 MSCOMCTL.OCX" (No quotes) in the box. That should fix the problem. You can also download the above mentioned file here from our website. Q. I do not have enough serial ports to use Smart Focus with the telescope control software I am using. What can I do? A. See some options for adding serial ports through a USB port or PCMCIA slot. Q. I would like to control the system from a distance. How long can the control cable be? A. We have sold many cables with lengths of up to 150 feet without any problems. Anything longer may work but will not be guaranteed to operate properly. Q. My computer places Smart Focus on a COM Port numbered higher than the maximum of 5 allowed by Smart Focus. What can I do? A. Check for forced COM port addresses and/or IRQs in the Windows Device Manager or in the BIOS settings. If this is the case, determine the reason that these items have been configured manually. If you allow the computer to use automatic settings, it should alleviate any problems. If not, try forcing Smart Focus to a lower COM Port via the Device Manager or BIOS and reboot, allowing all other devices to be assigned a port and IRQ automatically. You should be able to accomplish this by manually applying or forcing a particular address/IRQ combination to the serial port (or USB port if using a USB to Serial adapter). Q. Is there a discount when purchasing a "C" series focuser (EV-1c, EV-2c, EV-3c, EV-Bc) with Smart Focus since the Smart Focus hand unit replaces the regular hand unit? A. No, the reduction one might otherwise receive due to the removal of the regular hand unit is offset by the cost of installing the DRO Encoder System on the focuser.